Kelly Sundstrom is a national special needs spokesperson and writer. She writes content for major brands, magazines and newspapers, including Gather News, STACK Magazine, Colgate, Kudzu, LIVESTRONG and Lowe's Home Improvement. She currently has over 6500 digital and print articles in publication. Her awards include the 2012 Skyword High Flyer Award and the 2009 Demand Media Top Content Creator Award. Acne can occur on any skin type, including on skin that is dry and sensitive. Due to the delicate nature of dry, sensitive, and acne-prone skin, over-the-counter products should be avoided and replaced with gentle, natural products. Effective products will clear acne breakouts, while moisturizing and soothing the skin at the same time. When cleansing sensitive, dry and acne-prone skin it is important to use a cleanser or a soap that is extremely gentle and chemical-free. Natural soaps that are created from basic ingredients will clean the skin without aggravating dry, sensitive skin. Select a soap that does not contain artificial perfumes or dyes, chemical binders like sodium lauryl sulfate, or petroleum-based oils like mineral oil. Oil can also be used to clean out the pores. Using an oil to cleanse the skin keeps the skin deeply hydrated, while flushing out the pores. A non-comedogenic oil should be used, such as olive, castor, or jojoba oil, which can flush out the pores without causing more acne. The oil should be massaged into the skin for 3 minutes, then removed with a steaming hot washcloth. The skin should be cleansed up to two times per day. 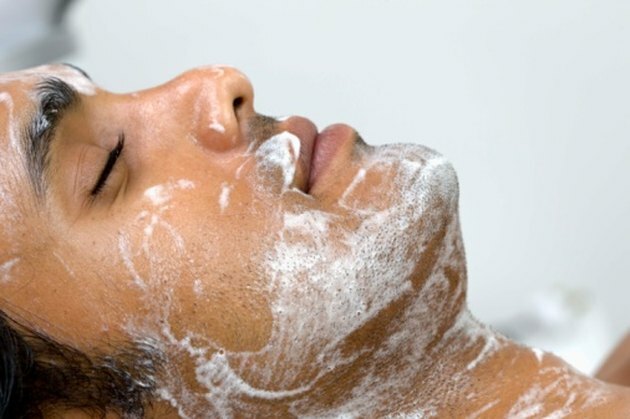 Cleansing the skin more than that can cause irritation and can exacerbate acne breakouts. Most over-the-counter acne treatments contain harsh chemical ingredients that can cause irritation on the skin, severe dryness, and can even cause chemical burns sensitive skin. For people with sensitive, dry skin, only natural acne treatments should be used. One of the most effective natural acne-fighting treatments is tea tree oil, an antimicrobial oil that the Department of Dermatology, Royal Prince Alfred Hospital suggests is just as effective as benzoyl peroxide in clearing the skin, but without irritating the skin. To spot treat acne breakouts, calamine lotion can be applied and left on overnight. Calamine lotion reduces irritation, and dries up acne pustules without drying out the rest of the skin. Moisturization is a vital step in caring for acne-prone skin that is also dry and sensitive. Natural oil-free moisturizing lotions designed for sensitive skin types or non-comedogenic oils can be used to hydrate the skin, and should be applied following an acne-fighting treatment. By using a moisturizer that will not clog the pores, the skin will be able to remain soft and supple without the pores becoming clogged. A natural moisturizer formulated for sensitive skin will be free of chemicals that can aggravate the skin. Select a moisturizer that contains basic, skin soothing ingredients, such as olive oil, beeswax or jojoba oil.